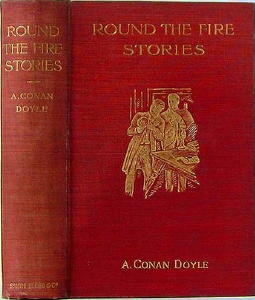 » Review by Mary Reed: ARTHUR CONAN DOYLE – Round the Fire Stories. Review by Mary Reed: ARTHUR CONAN DOYLE – Round the Fire Stories. In a previous volume, The Green Flag, I have assembled a number of my stories which deal with warfare or with sport. In the present collection those have been brought together which are concerned with the grotesque and with the terrible — such tales as might well be read �round the fire� upon a winter�s night. This would be my ideal atmosphere for such stories, if an author might choose his time and place as an artist does the light and hanging of his picture. However, if they have the good fortune to give pleasure to any one, at any time or place, their author will be very satisfied. — Arthur Conan Doyle, Windlesham, Crowborough. None of the Round The Fire Stories features Mr. Sherlock Holmes, although two mention anonymous letters to the press presenting solutions which some readers believe to have penned by the great detective himself (�The Man With the Watches” and “The Lost Special”). FOOTNOTE. In “The Man With The Watches” the titular corpse is found dead an hour into the London-Manchester rail journey. Three other passengers have disappeared yet none were seen to leave or join the train at the one stop made before the grisly discovery. Where are the missing trio and why is the dead man in possession of no less than six gold timepieces? The village of Bishop’s Crossing is the home of Doctor Aloysius Lana, whose olive skin led to his nickname of “The Black Doctor.” After receiving a letter from abroad, Dr Lana breaks off his engagement to Miss Morton, whose enraged brother Andrew declares the doctor deserves a good thrashing. Dr Lana is subsequently discovered dead and the evidence points to Andrew being the guilty party. But was he? Ward Mortimer is appointed curator of the Belmore Street Museum. Its greatest treasure is “The Jew’s Breastplate,” a gold artifact decorated with a number of valuable gems. Soon there are two burglaries, both of which focus on the breastplate. How is the miscreant getting in and why doesn’t the culprit just pinch the breastplate and be done with it? Louis Caratal and his companion, newly arrived in Liverpool from central America, must get to Paris without delay. Caratal charters a train to London but “The Lost Special” disappears between St Helens and Manchester, the only trace of its passage being the dead body of its driver, found at the foot of an embankment. The truth comes out some time later, and even then it’s as the result of a confession rather than an investigation. John Maple’s Uncle Stephen has one leg shorter than the other, so is known as “The Club-Footed Grocer” due to his high-soled boot, which regularises the length of the limb. One day John receives an urgent summons to his uncle, involving extremely odd instructions on how to reach his isolated dwelling. The mystery is slight, although the story has a touch of the Buchan about it. “The Sealed Room” opens with solicitor Frank Alder’s accidental (literally) meeting with Felix Stanniford, son of a disgraced banker who fled the country some years previously and has not reappeared, despite a letter two years before strongly indicating he will return. Given the title, almost all readers will immediately guess what the mystery might be and they’d be right. Lord Southerton’s nephew and presumptive heir to the family fortune is Marshall King, a spendthrift who devotes his time to frivoling about London. Marshall’s cousin Everard King has purchased an estate after returning from South America, bringing various wild life including “The Brazilian Cat” back with him. On the verge of bankruptcy, Marshall accepts an invitation to visit Everard. This story is not a mystery as such and while the plotline is predictable, there are moments of genuine excitement. It’s back to more traditional crime in “B. 24.” The narrator presents a plea for clemency, in which he admits to burglarising a country mansion, but adamantly denies killing its owner, Lord Mannering, and instead points the finger at Lady Mannering, who hates her husband and according to local gossip has reason to feel that way. B. 24 asks that her background be investigated before he is executed. Is he innocent or trying to save his neck at the expense of hers? My verdict: An uneven collection, although an interesting hour or two will be spent reading it. Most readers will guess the solutions but one or two twists may be more difficult to rumble and it was a refreshing change from Holmes and company taking centre stage. FOOTNOTE: I must thank various members of the Golden Age of Detection Yahoo group for their further discussion of this point. … and then we have “The Lost Special,” in which we learn of a letter: “… which appeared in the Times, over the signature of an amateur reasoner of some celebrity at that date, attempted to deal with the matter in a critical and semi-scientific manner. An extract must suffice, although the curious can see the whole letter in the issue of the 3rd of July. And I think we’ll agree the second letter in particular has his grammatical fingerprints all over it, but it raises another question: why didn’t Conan Doyle write these two adventures as Holmes stories? Were these stories written during a period when he was thoroughly tired of his own creation? A clue to the answer, I believe, is that in both cases the unnamed letter writer was wrong. In �The Lost Special�, the train had been driven onto one of the four side lines of which it was earlier remarked that they �may be eliminated from our inquiry, for, to prevent possible accidents, the rails nearest to the main line have been taken up, and there is no longer any connection.� The villains had temporarily relaid the missing rails. In �The Man With The Watches�, nobody jumped from one train to another. The dead man had been in the Euston to Manchester express all along, but had removed his disguise before his accidental killing, which occurred when his criminal associate attempted to shoot a third man who had joined them in their compartment but missed. Doyle’s intention, surely, is humorous. He is simply making fun of his own creation, Sherlock Holmes, who does not usually commit such blunders. “The Lost Special” and several of the other stories in the previous collection, “Tales of Terror and Mystery” (at least most of which also appear in this collection) left their mark on their namesake TV serial, “Lost”, which also slyly references several previous adaptations of that story and its apparent historic inspiration, the loss into a sink hole of engine 115 on Sept. 22, 1892.